What’s in a name? I used to wish that we all had the same name so that I could never forget it but that would be boring and terribly impractical. And names can be beautiful. I like names that start with A. Arya. Akash. I like names when they truly belong to the person. I don’t know if I am like my name but I think I am like my nickname. And I’ve grown up with this name so I love it. I love the slope in the ‘f’, the gentleness of the ‘l’. I love that both Shadow and I start with ‘Sh’. I love that those are the same two letters I have in common with R.
Fantasy usually places a lot of importance on names. So many times I have read that “names have power”. Reality claims not to care so much. And yet, most parents think carefully before they name their child and we feel the need to change other people’s names into nicknames. The story of the legendary eraser is a story M and I tell people to show them how small things change your life. Again and again and again. “Sorry but what’s your name?” “M__. What’s yours?” Again and again and again. It takes a day of repeating themselves and it is only at the end of the school day, when they stand in line to get into the bus that the stupid human asks the question for the last time. Nine years later, we tell this story to four of our new classmates so that they do not feel bad when we forget their names. So that they know that we may be best friends now but there was a time when we forgot each other’s names too. That just because I’ve forgotten their name, it does not mean I don’t like them and it does not make them any less special. 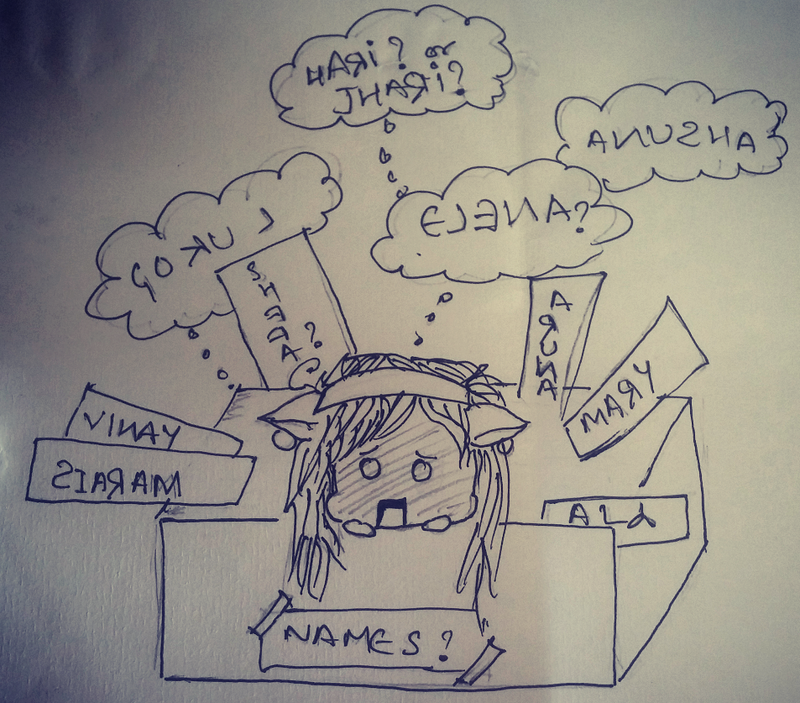 The story of how I forgot my name has become one of those stories I tell people when I want to apologize for forgetting their names. I tell it to K as we sit in the canteen together eating our rice and sambar because I forget someone’s name during our conversation. I open my mouth and then close it, shaking my head apologetically. “I’m so sorry,” I say, mortified. She tells me her name and I have a Eureka moment. Maybe, somewhere there is a handbook to handle awkward situations like this but I have not found it and so the best I can do is I tell her my story. When we go to Kerela this summer holidays, B Aunty tells us the story of her taking her nine year old niece to buy a book because like her mother, S had grown up loving books. She told the girl to buy anything she wanted to and so she walked around the shop, fingers drifting from cover to cover. Not too long later, B Aunty found her niece sitting on a little stool with a big book of baby names on her lap. The little girl looked so engrossed by the book that B Aunty wondered whether she was going to have another sibling. B Aunty was right but not in the way she thought she was. Her niece smiled at her and very matter-of-factly said, “We’re getting a dog”. When B Aunty finishes the story my parents smile and look at me. “I remember this!” I exclaim and B Aunty asks us how Shadow is doing. When we first join college, they organize us into smaller groups and after everyone in our group introduces themselves we all laugh and say that we’ve already forgotten each other’s names. It’s nice. It’s also strange but I learn all their names quite fast. It is becoming better, really. Having four roommates in one room means that people keep changing and I have to keep learning new names. At first, this was difficult because I had to keep track but now I am the one who remembers. “What’s her name again?” the others whisper to me. When U stays in our room, I find it difficult to remember her name and C does not know what it is either. I do not want to insult her by continuously asking her and it’s strange how well you can function without someone realizing that you don’t know their name. Keep smiling. Be nice. Talk to them but don’t use their name. A week later, I dream that she is telling me how to pronounce her name. I test it out. I should probably say that I don’t place much importance on the power of dreams but this time it works. I know her name. I tell C her name. And from then on, I keep using it. When I meet A at my parent’s college reunion, I forget her name once and as conversation leads to conversation I tell her that I once forgot my own name. Sometimes I tell this story and sometimes E tells this story of how at the age of eleven, we shifted to another school. As new students, we had to stand up and give our names. Time passed, as time will, and soon it was our turn. E watched as I stared at the teacher. The teacher waited. I waited. For a moment E wondered why I did not say anything. Then she decided she better do something before the situation became any more embarrassing. “Shefali,” I stammered. The class laughed and E smiled at me as I sat down, abashed but smiling. V and I are introduced to each other at least once every year. “Haven’t you already met?” M asks us. “No, I don’t think so,” he says. I smile. I never remember his name but he doesn’t even remember me. I vaguely wonder if I should feel insulted but I’m more amused. We’re all different but we’re all the same. T introduces herself to me four or five times before I say, “We’ve met.” She looks slightly surprised. Now, two years later, I think she recognizes me. I don’t think she remembers my name. My second day in class I put my hand up to answer a question. “Yes, S?” Professor A says. For a second I stare, dumbfounded. I struggle to remember what I was going to say, I’m too surprised that he knows my name. S and I became friends a week into college but it was only much later in that semester that she casually mentioned that her name used to be Simran but she changed it. The first two weeks that I knew S, in my head her name had been Simran. Each time I spoke to her, I had to keep editing that name out of my head. Not Simran. Not Simran. Not Simran. Why did I think of her as Simran? I do not know. Someone once told my parents they should name me Mary. I don’t feel like a Mary but people don’t understand what I mean when I say that. They do not seem to realize that our names are a part of us. Many people I know have never heard of dogs called Shadow but Shadow could have never been called by any other name. This name belongs to him, the way no other name could. Perhaps, it’s a good thing I finally did not buy that book of baby names. Shefali likes dogs, Harry Potter and anything blue.